Sjala is Sweden’s first machine woven wrap maker and they’re mostly known for fantastic merino wool elastic wraps that can be worn much longer than normal jersey stretchy wraps. Their first woven wraps came out in spring 2016 and here we are, two years later, with another beautiful release. I love my husband, he’s amazing. In addition, he understands the excitement and importance of Sjala fluff mail so he rescued a package that had gone to the depot and brought it down with him to my mother’s house where we were staying. 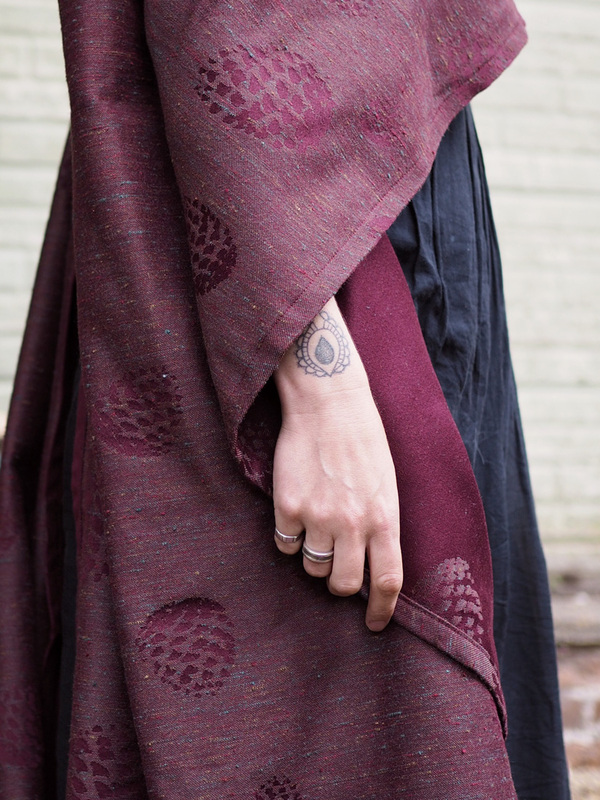 Point being, this is a special wrap in a blend that Sjala haven’t produced before and in a colour way that makes me go weak at the knees. So let’s talk blend details first. Autumn dreams comprises 51% burgundy cotton warp with a weft of 40% tussah and 9% cashmere…and it’s machine washable – like all Sjala. It arrived weighing approx 275g m/sq and post wash gained a little weight. I suggest it’s about 290g m/sq all in with minuscule length lost when hand washing (I love to hand wash wraps). 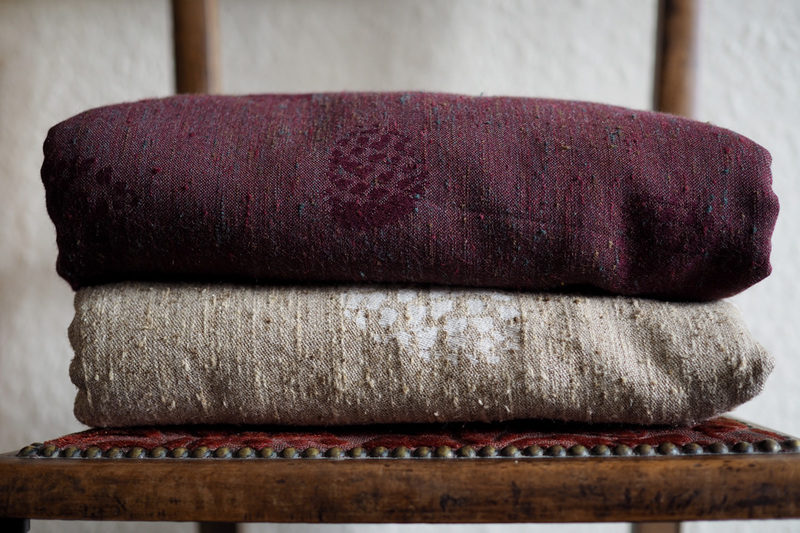 In hand, it’s a velvety wrap in look and feel because of the sumptuous burgundy cotton warp and its low contrast autumn hued tussah and cashmere. The tussah is very pretty, variegated, shot through with deep green, mustard and reds. 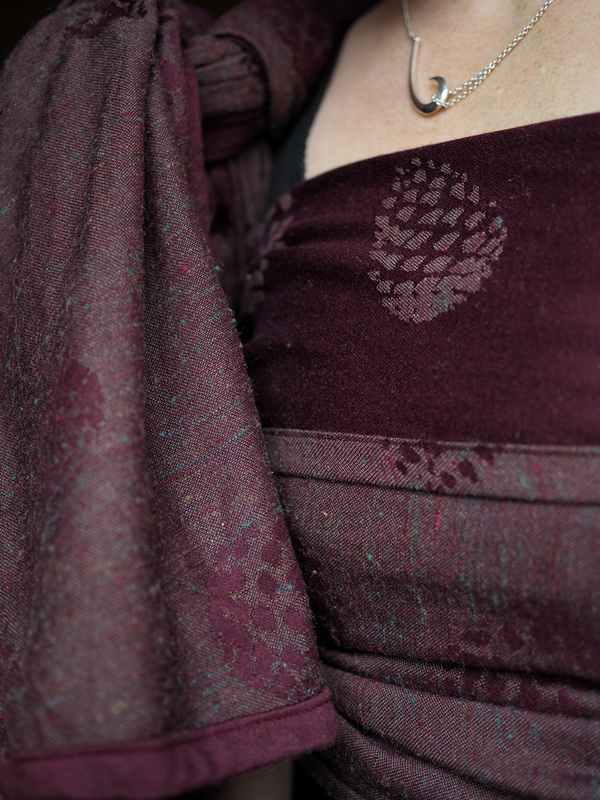 I had an early sense that this tweedy wrap would puff up with texture between the pine cones and their background and I was right. Yvonne weaves her tussah more densely than a lot of brands so you’re getting more in weight for your money and this translates to a stronger, less pull prone and more supportive wrap. 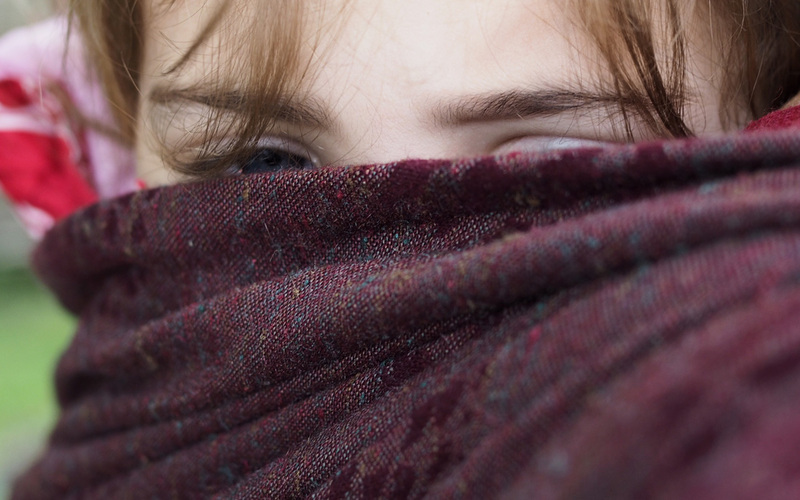 It also means that the nubs and slubs are contained within the weft, adding to that tweedy look. 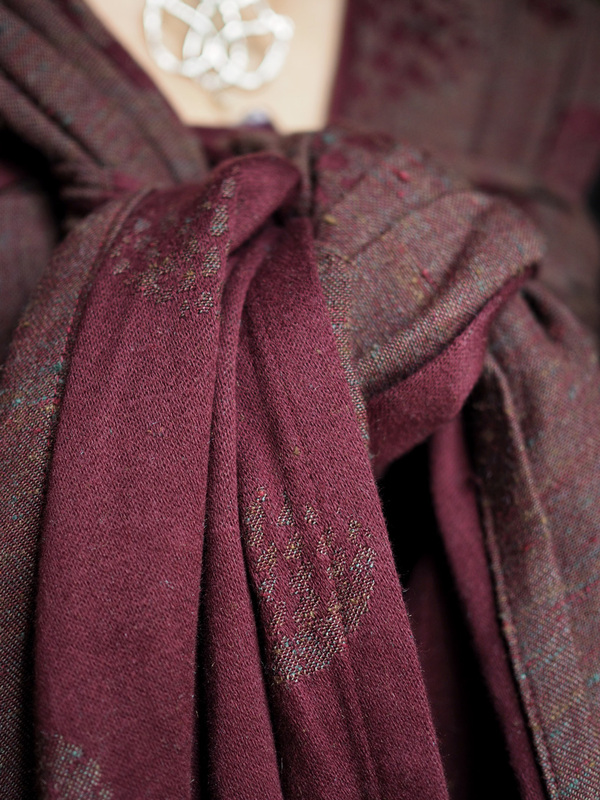 The addition of cashmere gives the wrap a slight sheen and has a definite effect on the wrapping qualities. My mother described the wrap as ‘regal’ and I agree. After the first wash the wrap had already started to break in but I got my eldest up for a bounce about and a chat. This helped to speed up breaking in so that when I got to wrapping Smallest for the first time it was already a pleasure to work with. So, I think the wrapping qualities are pretty stunning. The addition of cashmere to this denser tussah makes for excellent stretch and recoil which you just don’t find in high tussah wraps alone. This meant that for a double hammock, tied at the shoulder, I achieved a bandage like chest pass that hugged in the right places, neat shoulders and no dig. I’m lugging about a three and a half year old and often with a laptop and bag. I need a wrap that will support her and Autumn Dreams is a wrap with hidden muscly strength. No child at this age is weightless but I was comfortable and so was she. For a baby or younger toddler this will feel like you’re carrying a dolly. The wrap feels medium in hand which means it’s very easy to handle and so tightening a ruck meant I could get Smallest up really high and tie off right on my rib cage to keep her up there. 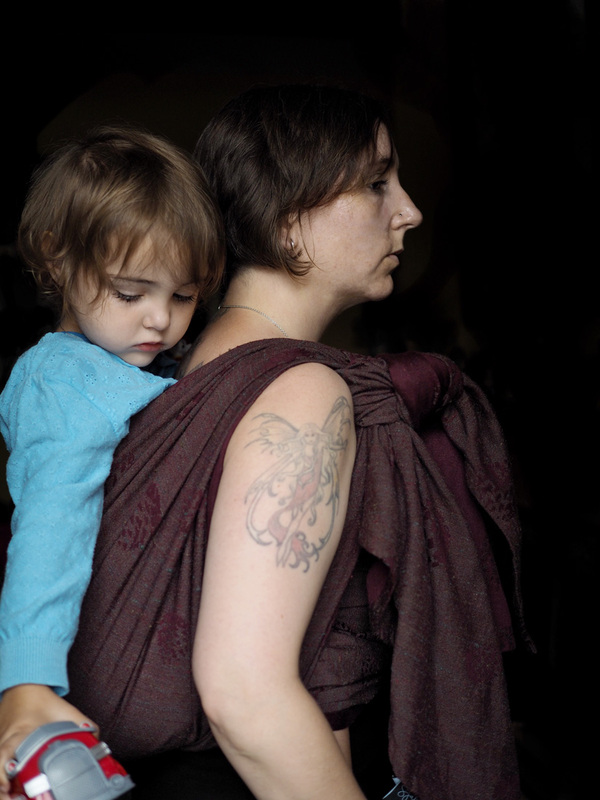 I love a ruck because the single layer makes it easier for her to burrow down if she wants to, but at her weight the wrap must be supportive and gentle on my shoulders. I was comfortable for the walk and can recommend Autumn Dreams in single layers. To work with, Autumn Dreams has an almost satin feel on the mostly cotton side which made me worry that tightening a front wrap cross carry, tied at the shoulder, would be a problem. It’s my latest nemesis carry because a wrap that is too bouncy or doesn’t have enough grip will mean Smallest drifts down uncomfortably and I get frustrated by readjusting the wrap constantly. I needn’t have worried because it held solidly with the scattered pine cones adding the anchor points I needed for grip. Smallest fell asleep on that walk home which I consider quite an accolade for Autumn Dreams. 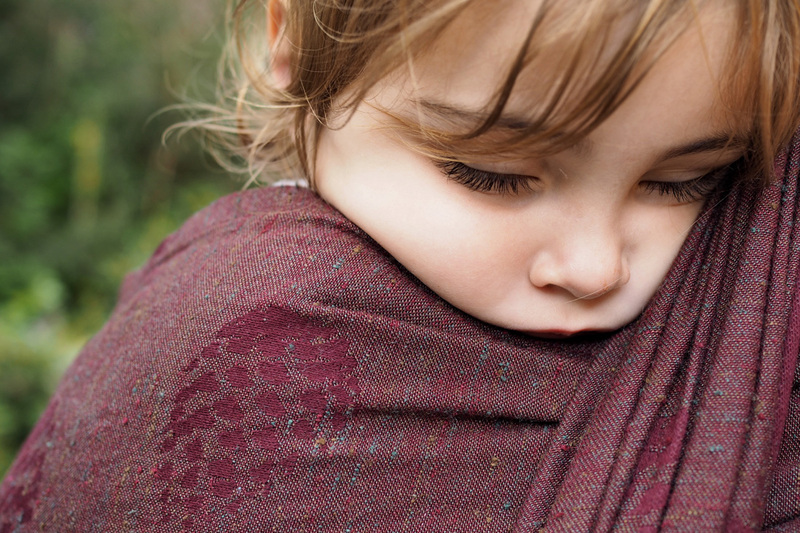 Autumn Dreams will suit a variety of wrappers and their children. Anyone shy of silks and the care they require (you do need to clean silks semi regularly – every few months – because accrued dirt isn’t a friend of this fibre) may prefer a different wrap. That said, it IS machine washable so popping it on 30 degrees with a low spin might not worry you. For geeks and luxury lovers this can’t be easily topped. Autumn Dreams was woven as a pre order but Yvonne wisely wove a few extras that will be sold via draw to purchase around 23rd August 2018. Keep an eye on the Sjala Facebook page. You can also find Sjala’s website here. 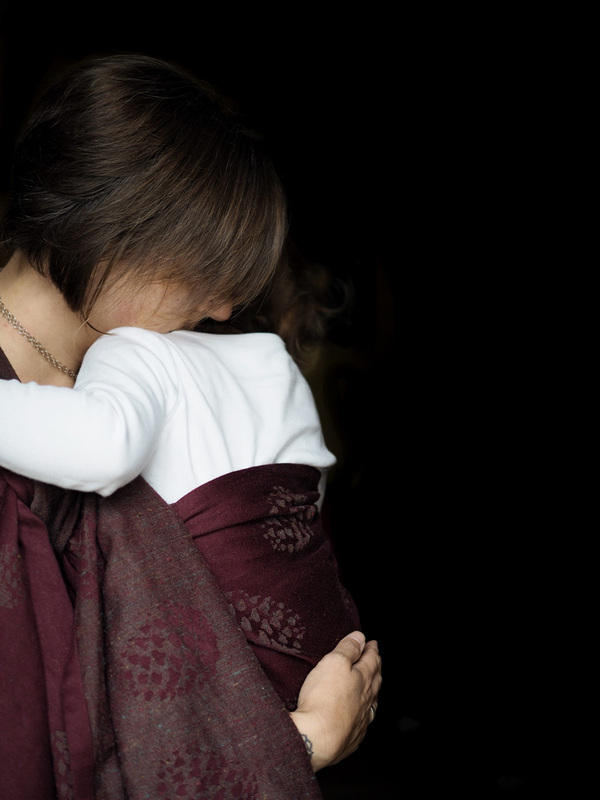 If you would like to get a feel of Sjala’s wraps they are exhibiting at the Babywearing Conference Sweden that is taking place in Stockholm on 1st September. You can buy your ticket here.